Open the ULINKplus dialog View - Analysis Windows - ULINKplus. 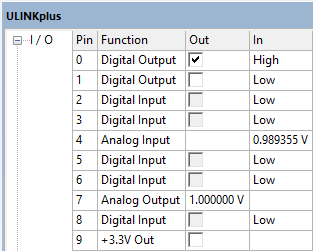 Out - If the function is "Digital Output", you can set the output to high by checking the box. Otherwise the output is low. For Pin 7, when configured for Analog Output, the pin voltage displays. In - Displays the current I/O voltage level if configured to "Digital Input"